Aficionados of guitars and guitar effects have a new source of information in a website made available from Vintage Guitar Effects. 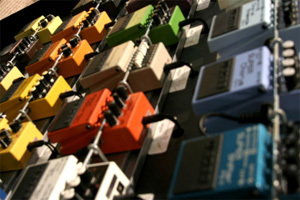 The site is devoted to vintage and boutique guitar pedals and effects. On the site, visitors will find tons of information including in-depth articles, reviews, and videos. It is a blog-based site which encourages user feedback and comments as long as it relates to guitar effects. Interested users can even subscribe to an RSS feed which will keep them up-to-date every time a new post is put up. Their extensive use of video is one of the things that set the Vintage Guitar Effects website apart from others. As an example, the January 31st entry is a review of the Dwarfcraft Eau Claire Thunder effects box. The review includes not only written information about the features of the box, but also a six-minute video demonstrating what this box can do. The author of the video plugs his guitar into the Eau Claire and puts it through its spaces, explaining to viewers what heâ€™s doing every step of the way. The video is a great way for users to see and hear the Dwarfcraft Eau Claire Thunder for themselves. This is a strong selling point very few other review sites offer. The site covers vintage guitar effects including compressors, bass pedals, multi-effects pedals, flange or pedals, overdrive pedals, and more. In the boutique guitar effects section, visitors will find items from well-known names like Boss, Death by Audio, Digitech, Excaliber Effects, Rockbox, and Solid Gold; just to name a few. Everything users need or want to know about purchasing vintage and boutique guitar effects is available on the site. For those looking for vintage or boutique pedals and effects for sale, the website also has a dedicated store. The store contains dozens of links to various products listed at popular auction websites. Although Vintage Guitar Effects does not sell the products themselves, their store categorizes products by type, for easy shopping and searching, and includes thumbnail images. Clicking a given link will redirect the user to the auction site where the item is located.